Ms. Upadhyay will share key findings of the ECPAT International’s three research studies, “Through the Eyes of the Child: Barriers to Access to Justice and Remedies for Child Victims of Sexual Exploitation, “Access to Recovery and Reintegration,” and “Barrier to Compensation for Victims of Sexual Exploitation” conducted between 2014-2016 through secondary data analysis and field research in the Philippines, Thailand and Nepal. The studies had three objectives, i) to analyze international and domestic law related to access to justice and care systems for child victims of sexual exploitation; ii) to understand the unique barriers that affect the access and participation of child victims in the justice and care systems, iii) and to put forth recommendations to address the identified barriers and challenges. Junita Upadhyay is a mid-career Masters in Public Administration candidate with the Edward. E. Mason Program at the Harvard Kennedy School of Government. She is also a Gleitsman Leadership Fellow for Social Change with the Center for Pubic Leadership at the Kennedy School. 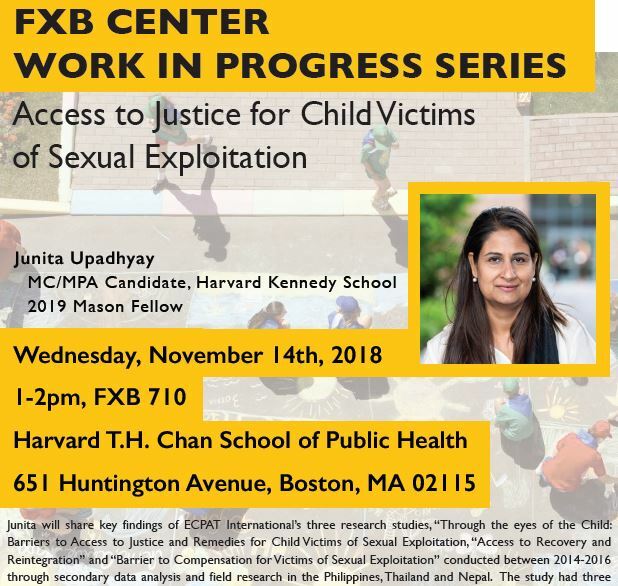 Previous to HKS, Junita was the Deputy Executive Director of ECPAT International based in Bangkok, Thailand – a global network of nearly 100 organizations across 90 countries collectively working to end sexual exploitation of children. Ms. Upadhyay is from Nepal, and brings with her over 15 years of international experience working to promote children’s rights and protection. Download a printable PDF for the event.